Aerial Yoga Teacher Training in Barcelona – Don’t Miss Next Dates! -IAA (International AeroYoga Association) Presents: AeroYoga® AeroPilates® Official TeacherTraining in Barcelona. Several Dates before the end of 2015! Suported by: -IAA (International AeroYoga® Association) -ANPAP ( Asociación Nacional de Pilates Aéreo© AeroPilates). THIS TRAINING INCLUDE OUR PROFESSIONAL ORIGINAL ORANGE AND WHITE SWING! 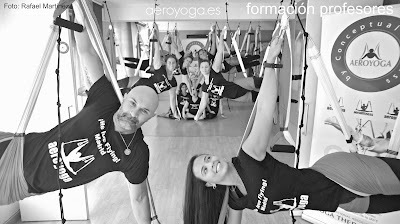 AeroYoga® & AeroPilates® Official International Teacher Training, by Aeroyoga Institute. Become a certified teacher and obtain in addition the right to use the international brand and the possibility of develop a new business potential. Want to learn & teach AeroYoga? You will be part of one of the professions most in demand and gives you personal satisfaction of helping others. Teacher Training Objectives The course developed by Rafael Martinez for Aeroyoga Institute is an artistic method (Art Therapy) Training and Complementary Therapies. The teacher training allows you to develop a different technique work effectively at all levels, that allows you in a professional way, to improve the health, fitness comprehensively, human relations in all aspects, it is fun, exciting, creative and you can develop a new professional future. 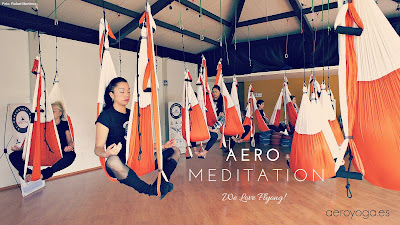 AeroYoga® Method is mora than yoga poses in a swing, is a new concept for working the body, consciousness and perfect poses in microgravity. -Professionals interested in training in the theoretical and practical aspects of Aeroyoga and AeroPilates, in training to transmit these teachings to others. -Professionals who wish to supplement their knowledge and open new employment and business doors: Teachers gymnastics, aerobics, fitness or similar specialties; educators and teachers of physical education. -Practitioners of alternative therapies or manual (naturopaths, massage therapists, chiropractors, dancers, artists, yoga teachers or professionals who wish to train in the Aeroyoga method to recycle their knowledge or obtain a professional diploma. Our teacher trainign offers a complete documentation in 2 ways, a complete text book with more than 300 original poses and a complet dossier with the official methods know how. Also a PENDRIVE with more than 8G of original know how documentation in video and text. 1- More than 300 original poses & variations. 2-More than 20 different class designs. 3. Benefits from Aeroyoga (supervised by medical specialists in sports medicine). 5. Developing Aeroyoga classes, AeroPilates and Aerial Fitness. 6. Aeroyoga Restorative postures with their benefits and contraindications. 7. Aeroyoga Vinyasa Level II – Postures to your benefits and contraindications. 8. Aeroyoga Vinyasa III Acrobatic – Postures to your benefits and contraindications. 9. AeroPilates I – Postures to your benefits and contraindications. 10. AeroPilates II – Postures to your benefits and contraindications. 11.AeroPilates III – Positions with its benefits and contraindications. 12. Aerial Fitness – routine exercises with its benefits and contraindications. 14. Anatomy applied to Aeroyoga and AeroPilates. 15. 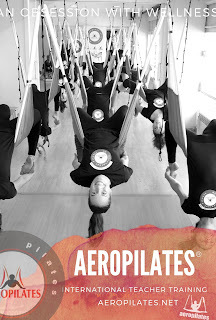 Physiotherapy and applied to Aeroyoga AeroPilates. 17. Ayurveda and applied to Aeroyoga AeroPilates. 18. Aromatherapy and applied to Aeroyoga AeroPilates. 19. Lithotherapy and Hot Stone Therapy applied to Aeroyoga and AeroPilates. 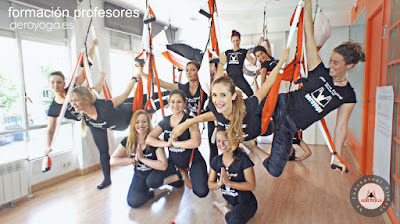 In addition, you will have the swing for your practice and 12 DVDs with different sessions Aeroyoga, AeroPilates, Aerial Fitness and directed by Rafael Martinez creator of the method. or 1490€ (400€ scholarship- for reservations in advance 30 day before) PAY IN 3 TIMES! (Studies and practices are monitored from AeroYoga® Institute and must be documented). AeroYoga® Institute is the first specialized Aerial Yoga Center Member of IAYT (International Association of Yoga Therapist). which you are interested for details about their programs. ArtTherapy in his trainings programs .